Spoiler alert. Or so I've been told there's one. This well-known anti-war novel came up as a reader comment on one of my Goodreads blog posts, and piqued my curiosity enough to check it out from our local public library. I knew the author Dalton Trumbo had been blacklisted in the 1950s for his alleged Communinist sympathies. He wrote Johnny Got His Gun (taken from a song lyric from the period) in 1939, and it nailed the National Book Award. Joe Bonham is a twenty-two-year old American doughboy rescued from the trenches of France during the First World War. He's been mangled by a mortar shell, and all that's left of him is a slab of meat. He's sans arms, legs, eyes, mouth, nose, and ears. Much of the narrative is his inner thoughts as he tries to keep his sanity. His memory of his past fills in the back story (Joe worked in a bakery) which I found the most interesting parts. The ending sort of drags out for me, and the war-is-bad moral is hammered down again, and again. Okay, I got the message already. Still, I overall enjoyed the read. Some the prose is memorable, and the anecdotes told are colorful. Could you let me know how it is? I've been wanting to read this one for a while. Yair wrote: "Could you let me know how it is? I've been wanting to read this one for a while." Sure, I'll review it when I'm finished if you want to catch my comments then. Thanks. If you ever wanted to know what bittersweet mean-- read this book. The hell of Johnny's world, his injuries and the strength of his life. 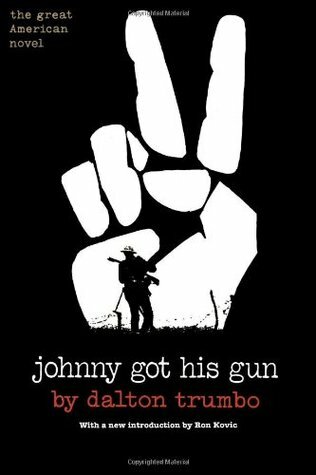 Yes, read the book... it has been years since I read Johnny Got His Gun and it still rings in my heart and mind. Susan wrote: "If you ever wanted to know what bittersweet mean-- read this book. The hell of Johnny's world, his injuries and the strength of his life. Yes, read the book... it has been years since I read John..."
Lots of passion in the book. Good stuff. I read this book many years ago, and the images from the book have remained with me. Simply written and powerful. Joseph wrote: "I read this book many years ago, and the images from the book have remained with me. Simply written and powerful." The images are vivid. I won't forget several of the scenes any time soon. Thanks for leaving a comment on the book. I also like your recommedations for crime fiction.I just ordered "Black Wings Has My Angel" from Amazon. Joseph wrote: "I also like your recommedations for crime fiction.I just ordered "Black Wings Has My Angel" from Amazon." Thanks. Easily one of my best reads of the year.